A small crocodile museum at Kom Ombo archaeological site welcomes visitors and offers a display of crocodile mummies, and ancient Egyptian rituals devoted to the god Sobek. Obelisk with Hathor and 2 crocodiles. 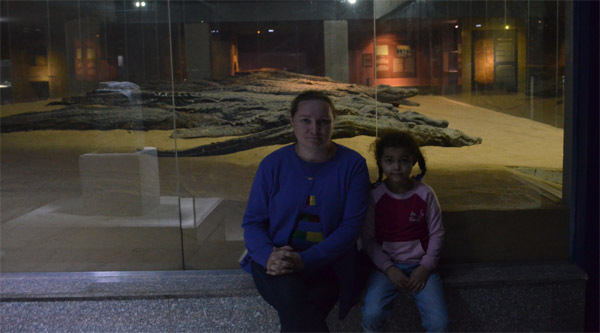 Crocodile museum excursion at Kom Ombo. Crocodiles cult at Kom Ombo. Mummified crocodiles on display at Kom Ombo museum. Egypt's first museum devoted exclusively to crocodiles was inaugurated at Kom Ombo archeological site. Overlooking the Aswan Nile shore, neighbouring the ancient Egyptian temple of Kom Ombo, the first ever crocodile museum in Egypt is now open to general public. The museum is located on the doorstep of the Ptolemaic Kom Ombo temple on the banks of the Upper Egyptian city of Aswan. The museum, which is dedicated to the ancient Egyptian god Sobek, displays forty mummified crocodiles, ranging from two to five metres long. The crocodiles are arrayed on a sand hill inside a large glass showcase, allowing visitors to see how crocodiles passed their days in ancient Egypt. A collection of crocodile coffins and wooden sarcophagi, along with crocodile foetuses and eggs, are also on display, in addition to stelae and statues depicting the crocodile-god Sobek, bearing a human body and the head of a crocodile. Replicas of Sobek?s original tombs and niches are also on display. The most significant artefacts currently on display are the gold and ivory teeth and eyes that had been inserted into the dead crocodiles following mummification. Also on show is a collection of wooden and granite crocodile statues and replicas of crocodile holes in rocks. Sobek mummification processes are also illustrated, as well as a funerary ceremony and burial in the necropolis. The principal temple at Kom Ombo dates to the Ptolemaic Period, although its foundations might be more ancient. The temple is unusual as it is divided into two parts. The southern part was dedicated to Sobek, who was worshiped here with the goddess Hathor as his consort, and the god Khonsu as their child. Sobek was viewed as a creator god, master of the universe, and was connected with other gods, many of whom played a key role in creation. On the northern side of the temple, the cult of Horus the Elder and its family here (wife Tasenetnefret and son Banebtawy) was celebrated. In some myths, Horus is called the brother of Sobek. A small chappel dedicated to Sobek alone lies northwest of the main temple precint. West this is a rock-cut pit lined with quarried stone blocks. Some scholars have suggested that this is a cistern, but others believe it was a sacred chamber in which a living crocodile, earthly incarnation of Sobek himself, was kept. The custom of keeping a sacred animal at a temple was particularly popular from the Late Period throughout the Roman era. The Egyptians believed that a portion of the god's divine essence entered into the body of his totemic animal, making the animal an incarnation of the god. During his lifetime, the sacred ncrocodile would have been well fed and cared for, and might even have given oracular advice to his devotees. After his death he would have been mummified and burried with a great pomp, and then the priests would have identified a new crocodile to play host to the divine sperit of Sobek and be his manifistation on earth. Many crocodile mummies were found in a small shrine of Hathor located just inside the southern emclosure wall of the temple, as well as in the nearby necropolis of el-Shatb. The Sobek Cemetery is situated near a small village of El-Shatb, about 2 kilometres south of the modern town of Kom Ombo, and has yielded vast numbers of crocodile mummies. The cemetary covers an area of about 42 acres and is divided into northern -164 tombs excavated, and southern - 73 tombs excavated, sections. The excavation works were carried out at the cemetary by the Egyptian Antiquities Organization between 1965-68 and once again 1971-1983. The cemetary was used from the Middle kingdom throughout the Greco-Roman period. Most of the tombs in the Sobek Cemetary were cut into the hard ground, with mud-bricks supports added wherever the soil was unstable. The tombs were undecorated, with no superstructures. Although there are architectural changes over time, the majority of the tombs of the Greco-Roman era consist of an entrance from above with a staircase leading down the shaft into an antechamber, which opens into the burial chamber. The doorway to the burial chamber was blocked with a mud-brick wall. Depending on its size, the burial chamber contained one or more sarcophagi lying on the floor, or in niches (loculi) cut into the walls. In some cases, a second level containing additional burial chambers was added above the first. The majority of the tombs had been plundered, leaving behind only animal and human mummies (some in the same sarcophagus), and some pottery vessels. In addition to human burials, the cemetery contains a large number of animal mummies, the majority of which were of crocodiles of various sizes, from egg to large adult, as well as fish, dogs, hawks, parts of cattle and the head of a gazelle.